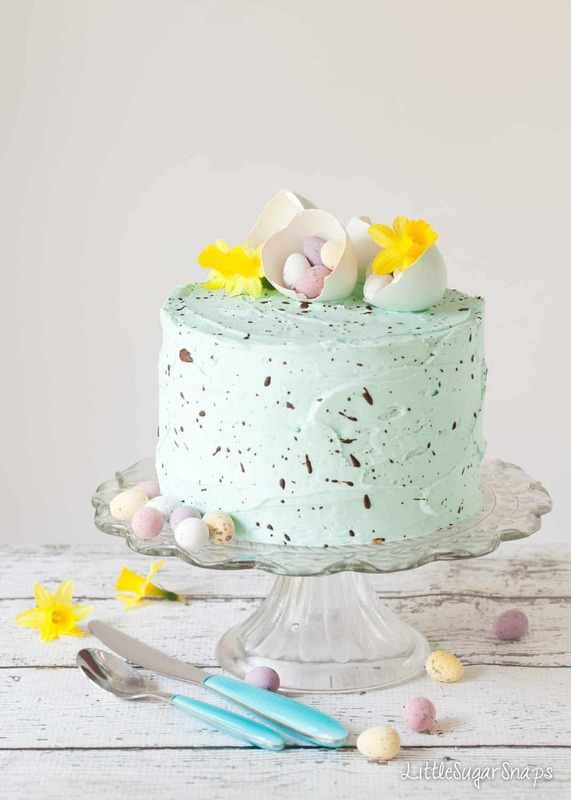 Excessively pretty and perfectly suited to Easter, this Speckle Cake contains layers of white chocolate sponge sandwiched together with delicate pastel coloured peppermint buttercream. It’s almost too pretty to eat. I’ve nearly made it. Cake-a-thon 2017 is about to end. For those of you not in the know, during the space of 8 days in March both my kids have their birthdays. They also have separate birthday parties, so I end up baking 4 different cakes within about 10 days, That, my friends, is alot of cake. It’s a cake-a-thon. This year my cake-a-thon has been very successful – I’ve had no kitchen disasters (so far – there’s still time) and I’ve managed to create this White Chocolate Peppermint Speckled Cake for one of my girls. These are my favourite bakes of the entire year. My girls can hint at what they might like, but I’m under no obligation to listen. I get the final say. 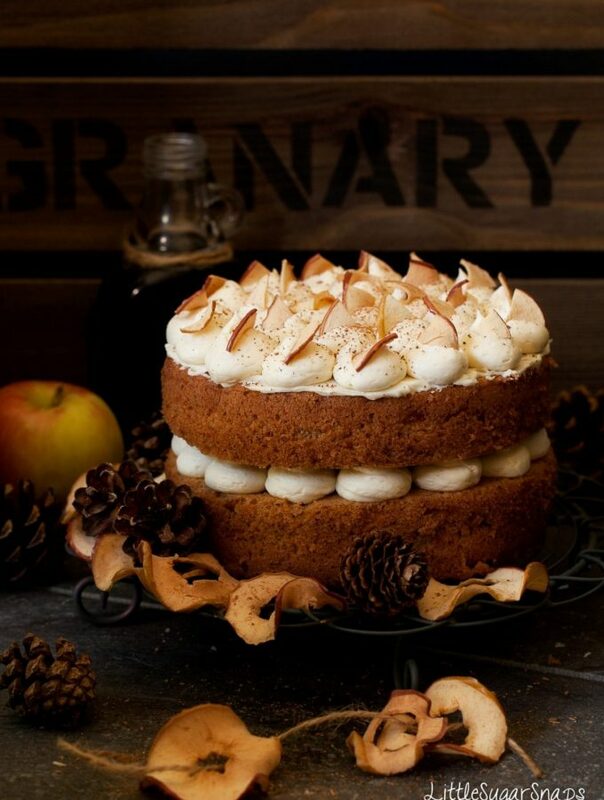 What motivates my ultimate choice of cake is usually something personal to each child, matching up favourite flavours or treats, or ingredients with their personalities. This White Chocolate & Peppermint Speckle Cake came about because my younger daughter loves chocolate, mint and mini eggs. What can I say? Life is simple when you are eight years old. She was born just ahead of Easter and, in those early days eight years ago, as I wheeled her around the village in her pram, the springtime daffodils seemed to be at their peak. Springtime. Easter. Chocolate. Daffodils. It all just happened on this cake. Inside of this Speckle Cake are three layers of white chocolate sponge cake – soft, light and wonderfully flavoured. I’ve sandwiched each layer together with slim layer of simple buttercream, flavoured with peppermint, which I’ve also used to cover the outside of the cake. The mint flavour is strong enough to taste but not so strong it overpowers the white chocolate. I opted for a pastel shade of blue on my cake, but light tones of pink, yellow or purple would also look great. Confession: cake decorating is not one of my strengths. I was hoping to create a perfectly smooth covering of buttercream, but after 15 minutes of trying, it became obvious to me that I wasn’t going to achieve that look. Swerving frustration, I changed tack and opted for a more rustic look, which seems to work just as well with the speckled decor in my opinion. Creating the speckle effect was not as difficult as I thought it would be. It’s just a case of mixing a brown “paint” together (cocoa powder, vanilla extract and water) and then flicking this paint at the cake until you’re satisfied with the amount of speckling created. Kind of fun… and slightly messy. 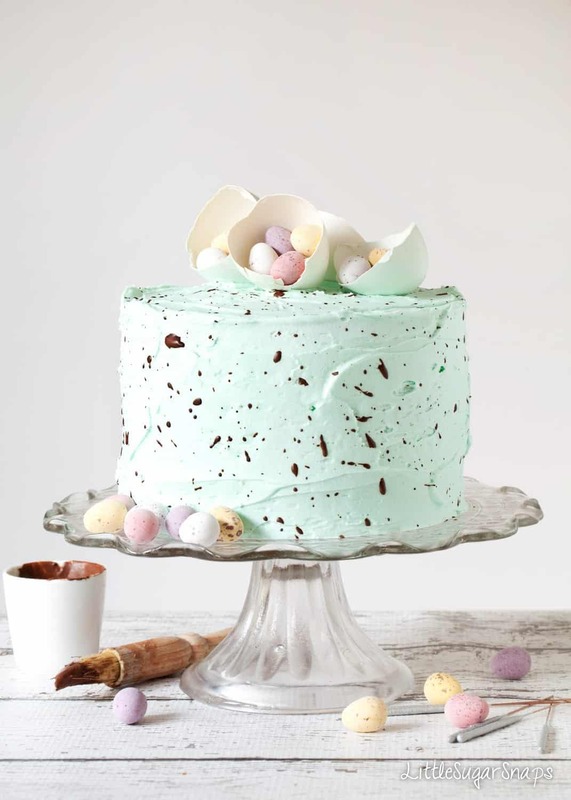 A Speckle Cake does look especially pretty and they are particularly fitting for Easter-time when chocolate eggs are easy to lay your hands on. If you are decorating with fresh flowers make sure they are edible (check this list). Daffodils are not fit for human consumption, so you’ll need to use artificial ones if you want to replicate my decoration. And now I must fly since I have my final bake of Cake-a-thon 2017 to finish – hopefully without a hitch. 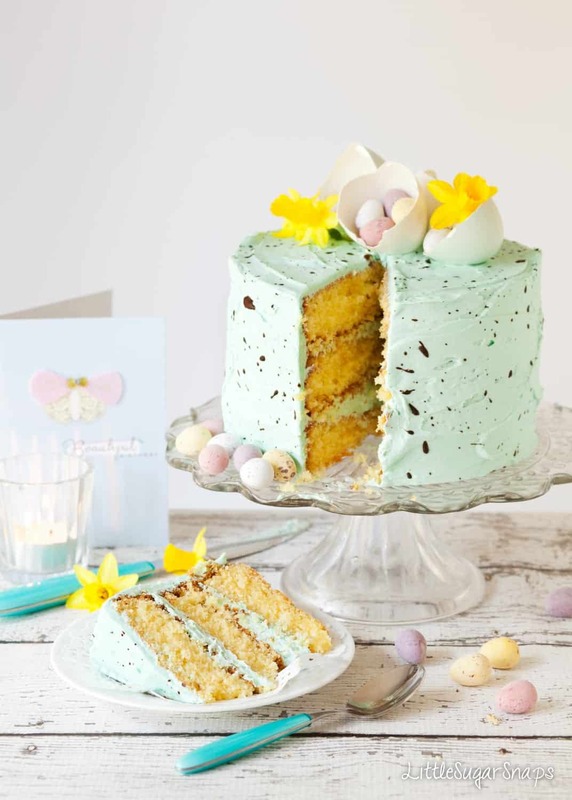 Perfectly suited to Easter this Speckle Cake contains layers of white chocolate sponge sandwiched together with delicate pastel coloured peppermint buttercream. It's almost too pretty to eat. 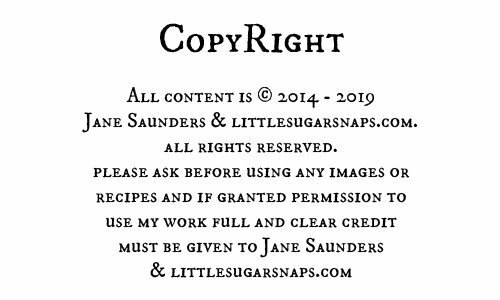 The recipes below is sufficient for 3 x 6-inch cake tins - these are smaller than normal. If you would like to use 8-inch tins see measurements in the notes. To make a 3 layer cake in 8 inch tins use the following measurements - fill your tins 2/3 full. 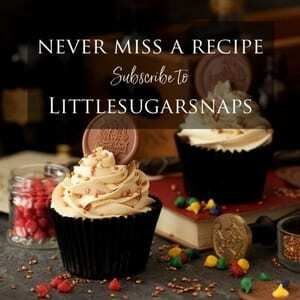 Do not overfill but if there is spare batter make a few cupcakes. You may need to bake these larger sponges for a few more minutes. For the Cake: 300g/ 1 1/3 cups / 10 1/2oz softened butter; 300g/ 1 1/2 cups / 10 1/2oz caster sugar; 5 eggs; 5 tbsp milk; 300g/ 2 1/2 cups / 10 1/2oz plain (all purpose) flour (sifted); 2 1/2 tsp baking powder; 250g/ 1 2/3 cups / 9oz white chocolate - finely chopped. 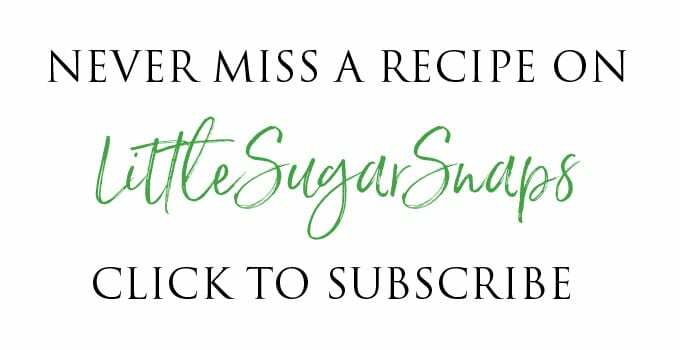 For the buttercream: 300g/ 1 1/3 cups / 10 1/2oz softened butter; 450/ 4 1/2 cups/ 16oz icing (confectioner's) sugar; 1 tbsp milk; Peppermint extract - around 2 1/2tsp but this may vary depending on brand so start with 1 tsp and taste before adding more; Gel food colouring. That’s so sweet how you craft each cake based on your children’s personalities! 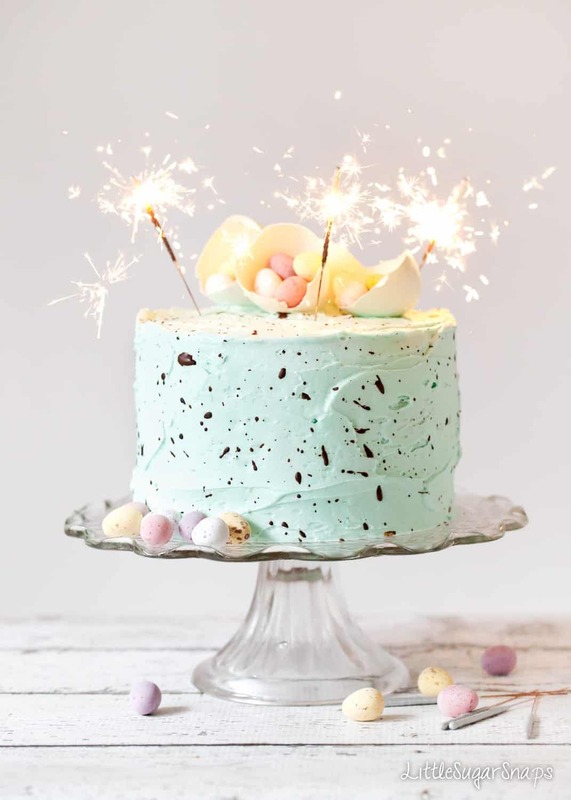 I never really had cake at Easter but for some reason every time I see this I remember hunting for easter eggs, easter egg baskets, and mint chocolate chip ice cream cakes, which kind of have that speckled look to them. White chocolate sponge cake sounds AMAZING though. I didn’t have cake at Easter either as a kid- we’ve been deprived! But it’s really perfect for a dessert centrepiece over the Easter weekend or for a birthday coinciding with Easter.. or any time of year, I refuse to be restricted. I think the rustic look is much better. I love the colours, duck egg blue, and you chose wisely on the pastel mini eggs. I wish I could eat that slice. Thanks Gillian – I’d mail you a slice but it’s all gone now. Oh my, what a piece of art! This cake looks way too beautiful to be eaten. So yum. Thank you so much for sharing , pinned! 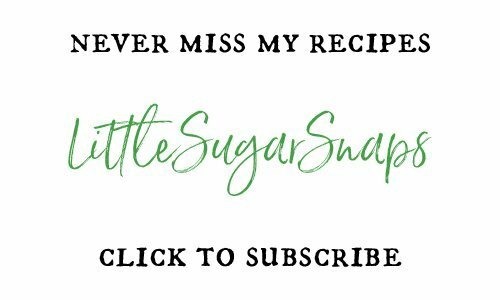 Thankyou Julie – don’t delay – make it! Cake-a-thon seems like a crazy time, congratulations for surviving. I love your personal touch to this cake, it is a lovely idea. The cake itself sounds amazing, and looks fantastic. I would be delighted to have this as my birthday cake. Thanks Helen. Cake-a-thon could easily also be known as cake-wars or death-by-cake – there’s only so much cake an adult can handle. However, making something personal and impressive helps get me through. I LOVE the look of this cake! So perfect for this time of year! Love this cake so much Jane! It is gorgeous and looks delicious. Your girls are so lucky to have such a talented mom! Hi Lynn. Thankyou. Now, prepare yourself. I seem to recall you were more than a little… erm…. in awe? shocked? totally dumbfounded? at the pickle I got myself into last year. So, let’s put last year ranking 12/10 on mess factor and assess truthfully. I’d put this cake’s mess making ability at a mere 3/10. Had I got my kids involved I’m sure that would have pushed it up to 9.5 but nothing, nothing can ever compare to the destruction of last year… at least, I hope not. I think speckled eggs are so pretty. They are my favorite thing to decorate with at Easter. I love that this cake is chocolate mint flavor! Not only does it match the colors but is pretty awesome all by itself! Thanks Jen. I totally agree, speckled eggs rock. They remind me of my Gran, who had a particular soft spot for them, so I always think of her when I have some on the go – which is often when they are in the shops, since I like to be reminded of her. Your girls are certainly blessed! What a fun, and beautiful cake you’ve created for them! Mint and chocolate is one of my favorite flavor combination… Happy Easter! Thankyou Tamara – the very same to you. Has this cake ever been made ahead of time and frozen before icing? I haven’t frozen it before I’m afraid. I’d guess that if it’s not been iced there shouldn’t be a problem, but if you try freezing it, let me know how it works out.